something new and enjoy the fantastic independent culture that Digbeth has to offer! potential of material and the in-between state through an eclectic mix of substance; glass, metal, water, sound, gel, neoprene, sand, fabric and light. For February’s Digbeth First Friday Olga Grotova and Zach Dawson will present a performance, which will be happening at Centrala throughout the night. The artists take diagrammatic scores, which propose multiple connections of sound to physical materials, light, and time as the starting point. During the event the scores will be freely interpreted to generate new sound, meanings, objects and conversations. Join artist and writer Zarina Muhammad, and her cousin, musician Sujan Haria for a performance: a dramatised reading of GOOD MORNING.. , an essay on WhatsApp greeting cards, image circulation, and the aesthetic value of kitsch. Head to Stryx to see work fom the recently selected BLENDER: soup ptV artists in residence: Lucy Andrews, Matt Gale, Kurt Hickson, Gemma Jones. The exhibition will showcase the artists’ current practices alongside a video installation discussing their artistic concerns and outlining their individual aims for the residency project. BLENDER is the next phase of Soup – Stryx Artist Residency Programme in partnership with Asylum Gallery. The project is a catalyst to strengthen relationships & exchanges between the partners, supporting a strategy to build a strong connected arts community. BLENDER allows expansion of networks & diversification of audiences across Birmingham and Wolverhampton. 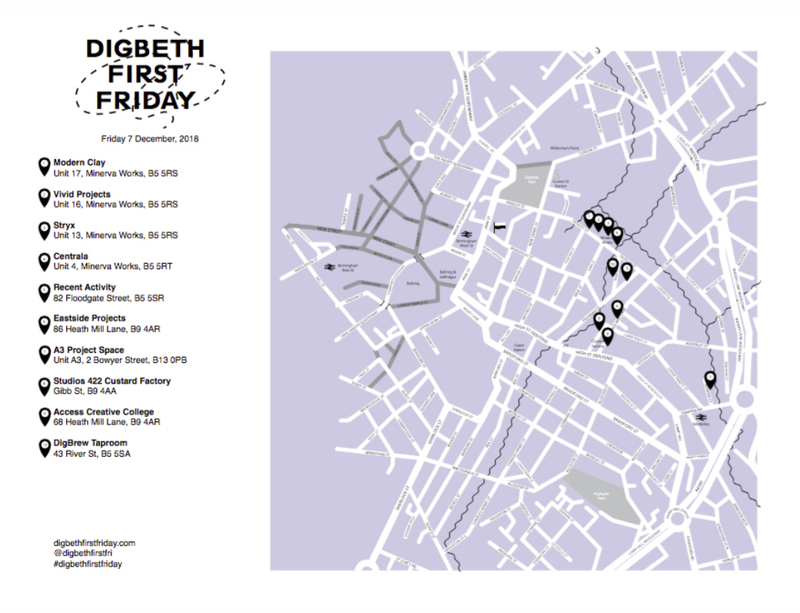 For February’s Digbeth First Friday Recent Activity will present a new iteration of Nomadic Vitrine, featuring work by Navi Kaur. Navi is a Birmingham based artist who often makes work commenting on the migrant experience, specifically around journeys, environment, storytelling and documentary.